Synopsis: Based on the controversial book by political journalists John Heilemann & Mark Halperin, this entertaining movie gives us a small glimpse into the murky backrooms of American politics & how they created a veritable Frankensteins monster - Sarah Palin. With America's never-ending fascination with the cult of celebrity, Palin recognized that her star was on the rise, eclipsing her senior running mate, respected US senator John McCain. This film convincingly portrays this transformation from hockey mum to serious contender for the highest office one can attain to. Wasilla to Washington? Made it Ma, top of the world! Anchored by a superb doppelganger performance by the very talented Julianne Moore, and ably backed by an extremely supportive cast (Ed Harris, Woody Harrelson, Amy Adams to name a few), Game Change offers a peek into the desperate selection process for the running mate for senator John McCain's bid for president in the 2008 elections. Clearly aware that their race is becoming all about the cult of personality (Obama's stratospheric rise partly courtesy of the media's growing anticipation that he could indeed, be the very first Black president), McCain's team became increasingly convinced that the only thing that could make a significant difference to their faltering campaign would be to introduce a candidate who would be a potential 'game changer'. Someone who could excite the base constituency, someone who wasn't another crusty grey male that wouldn't easily connect with the women & youth of America. After a brief search, finally a real possibility enters the frame. 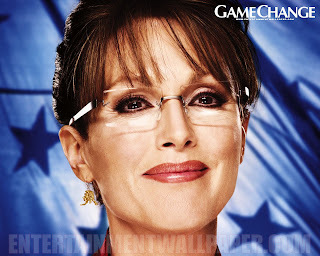 A small town mayor who then won the governors post in Alaska, Sarah Palin was viewed as the candidate with the necessary X-factor that been missing in the other alternatives. She spoke from the heart, with a rogue conviction, reminding McCain of his own similar character traits. Perfect they all sighed, here's our celebrity to counter the democrats rising star, lets get her out there - and show America that this fight is not over yet! However, when you invariably thrust someone into the unflinching gaze of the intense media spotlight, you had better hope that they have the strongest personality that can withstand the oncoming storms of speculation, innuendos, gossip, and fabrications that can knock the self belief & confidence of even the most battle hardened political warriors. Politics isn't for the faint of heart. This film needed an actress who could express all these conflicting emotions and more. That Julianne Moore does with considerable aplomb, using all of her supreme acting talent to get us into the mindset of a person who entered rather naively in retrospect, but emerged at the end of the journey acutely aware of her status as a name - and force to be reckoned with. In wisely choosing to focus on one aspect of the book that it is based on (Ignoring the Obama/Clinton battle & Republican battle for their candidate), this film is a reminder of the brutal nature of politics, the republicans desperate need for a star to counter the rise of Barack Obama. They nearly got what they wanted, frightening when you consider just how ill prepared Palin was for a job of this significance. With its assured cast, finely honed script, Game Change is a most worthwhile entry into the genre of film based on a book, entertaining us with a rather accurate story of how a nobody became a somebody. Somebody who could still have a major part to play in the future of American politics yet.